Moji Designs offers a comprehensive range of professional lampshade making and textile printing masterclasses in Brighton and Hove. Our carefully designed workshops is what sets us apart from other craft providers as you’ll not only get the opportunity to discover and develop practical new skills but also receive invaluable craft business start-up advice and guidance. From 1-2-1 to occasional group workshops, we support artists and designers in building a successful craft business. Everyone of all ages and abilities are welcome. 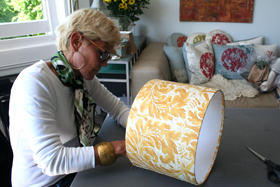 This in-depth workshop covers construction of a fabric covered drum lampshade including techniques such as preparation of the lampshade rings, application of top fabric to PVC backing, edge rolling and finishing off with wide range of trimmings. During this workshop each student will also receive invaluable craft business start-up advice and guidance. This in-depth workshop covers construction of a tailored hand-sewn and lined lampshade including traditional techniques such as stretching on cross grain, balloon lining, pining, frame binding, lampshade stitches and finishing off with wide range of trimmings. During this workshop each student will also receive invaluable craft business start-up advice and guidance. This in-depth workshop covers construction of a lined shade of your choice: Gathered, box pleated and knife pleated including techniques such as balloon lining, pining, frame binding and lampshade stitches and and finishing off with wide range of trimmings. During this workshop each student will also receive invaluable craft business start-up advice and guidance. This in-depth workshop covers construction of 3 different lampshade styles using traditional and modern lampshade making techniques: A drum lampshade, a tailored lined lampshade and an advanced shade of your choice: Gathered, box pleated, knife pleated or paneled shade. Each student will also receive invaluable craft business start-up advice and guidance. This in-depth guided origami lampshade making masterclass covers various paper folding techniques. Students will learn the process of designing and constructing a medium size folded lampshade by following a set of directions to turn flat sheets of paper into 3d forms. During this workshop each student will also receive invaluable craft business start-up advice and guidance. During this in-depth workshop we will equip you with the knowledge and skills required to design and print your own fabric by learning three different techniques: paper or vinyl stencil screen printing, linoleum block printing and drawing fluid screen technique. During this workshop each student will also receive invaluable craft business start-up advice and guidance. Starting a new craft business is very fulfilling, but it can also be complicated. If you are starting a new venture and need to have a better understanding of all aspects of starting and running a successful craft business with confidence, this course is the ideal one for you. Comprising of five basics start up business segments; Branding, Marketing, Pricing, Selling and Trade shows. Whether you are just about to set up a craft business or already running one, looking at your business objectively can be a challenge. This 1 hour consultation session will provide clarity on different aspects of your business if you are an small craft business owner in need of an outsiders’ perspective on structure and strategies of your business that you may have overlooked or are struggling with. During this in-depth workshop we will equip you with the knowledge and skills required to construct 3 professional looking tailored shades and give you valuable advice to help you get your business off the ground. During this in-depth guided origami lampshade making masterclass you will learn the process of designing and constructing a medium size folded lampshade by following a set of directions to turn flat sheets of paper into 3d forms.